PS prices are spiraling down both in the European and Asian markets. 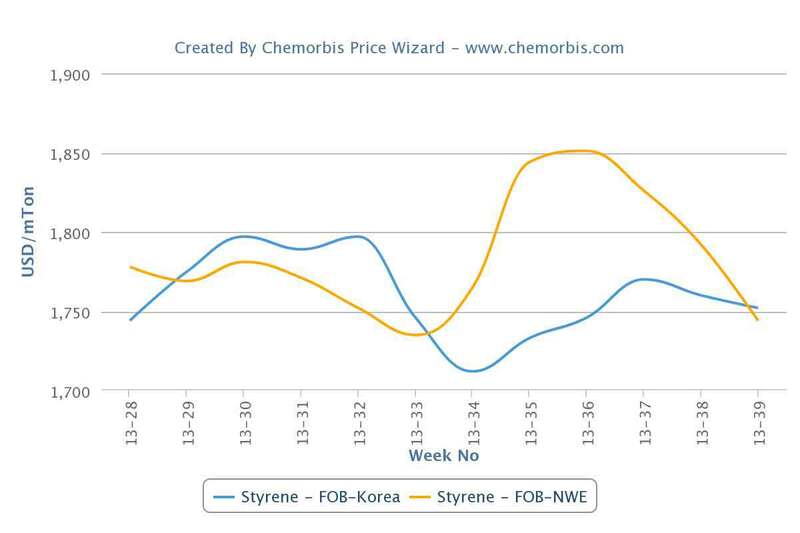 Lower upstream costs and thin buying interest pull down polymer prices in these regions.In Asia, spot styrene costs are $115/ton lower both on FOB Korea and CFR China basis while spot benzene prices are down by $50/ton when compared to the beginning of October. In the contract market, a November benzene contract was reported to settle with a $42/ton drop from October. In China’s PS market, import Asian PS prices given to the country recorded $60-80/ton decreases for both dutiable and non-dutiable GPPS while HIPS prices came down by $30-80/ton during last week. Lower styrene costs and poor buying interest were pointed to as the main reasons behind these declines. Inside China, local market levels also recorded decreases and the range came down by CNY50-200/ton ($8-33/ton) week over week. Sellers, feeling under sales pressure, appear to be willing to cut their prices in order to speed up their sales. A Taiwanese trader reported cutting their prices to China by $50/ton and highlighted the lower upstream costs and weak polymer demand amongst the main reasons behind their decrease decision. “We prefer to do back-to-back business and watch the styrene prices in order to have a clearer view of the market,” he further added. Another trader highlighted the sluggish trade and buyers’ expectations of further decreases. Meanwhile, in Europe, upstream costs are tracking a similar downward trend. 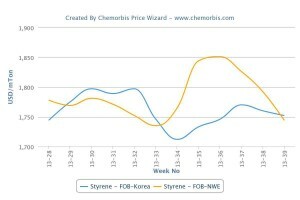 Spot styrene costs were down by $50-60/ton and benzene prices were down by $90/ton on a monthly basis. Apart from these, an initial benzene contract settled with €78/ton decreases from October while buyers’ expectancies were also about lower November styrene contracts last week. In Italy’s local market, spot prices are down €30-40/ton on the low ends of the ranges for both GPPS and HIPS when compared to the previous week. In the contract market, gentlemen agreements were concluded with €80-90/ton decreases for October. Regarding the market expectations, PS players were anticipating lower prices to emerge in November.